New Jersey’s medical marijuana program swelled during Gov. Phil Murphy’s first year in office, doubling its number of patients to more than 39,000. The number of doctors also grew, from just more than 500 physicians to nearly 900. But Murphy wants even more doctors to join, so state officials have been hitting the road to convince medical professionals of the benefits of medical marijuana — and dispel what they say are the myths. 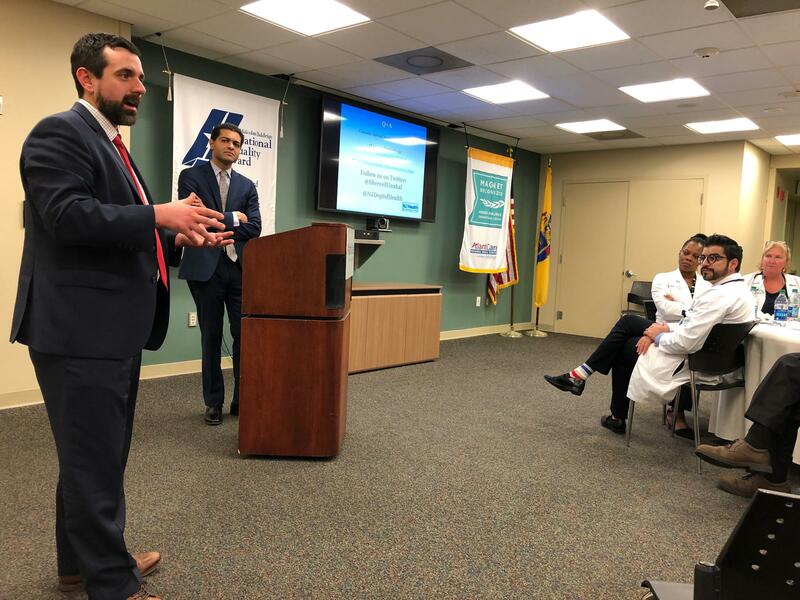 “What we’re really trying to do in New Jersey is to have a real, medical program,” said Health Commissioner Dr. Shereef Elnahal, during a presentation Wednesday in Atlantic City. Elnahal spoke to doctors and other staff at AtlantiCare Regional Medical Center, his eighth presentation in a series of grand rounds lectures he has been delivering at hospitals and medical schools since May. Medical marijuana was legalized in New Jersey under former Gov. Chris Christie, but it was difficult for many patients to qualify for the drug let alone get marijuana in the form they needed. Murphy vowed to open up the program when he took office in January 2018. His administration increased the list of qualifying conditions, paved the way for new dispensaries to open, and allowed doctors to join the program without being listed on the state’s website of participating physicians. Still, many in the medical field remain wary of recommending a drug that is still illegal under federal law and known to have detrimental side effects. One audience member asked Elnahal if the state was monitoring doctors to make sure they were not giving out marijuana to patients who wanted to use it recreationally. Elnahal said rooting out abuse is one of the administration’s priorities. The state Board of Medical Examiners recently suspended the medical license of Dr. Anthony Anzalone, a physician the state Attorney General’s Office said “created a multimillion-dollar enterprise by indiscriminately authorizing marijuana use for thousands of patients.” According to officials, Anzalone had 2,077 patients, while the average number of patients for a physician in the medical marijuana program is 45. Doctors at Wednesday’s presentation also wondered whether the pros of medical marijuana outweigh the cons. Dr. Inua Momodu, who chairs AtlantiCare’s psychiatry department, questioned why the drug is approved to treat generalized anxiety when one of its known side effects is social anxiety. “When you then use that, and you have … social anxiety as a side effect of this medical marijuana, what anxiety are you really treating?” he asked. Although Momodu supports prescribing medical marijuana to patients with terminal diagnoses and chronic pain, he said he will not recommend it to patients without the approval of the federal government, which still classifies marijuana as a Schedule 1 drug. “Right now, I’m not convinced that I’m going to prescribe medical marijuana for any patient, because there is no federal research evidence to support it,” he said. Elnahal said he hopes his presentations across the state convince more doctors of the benefits of medical marijuana and encourage them to join the state’s program.